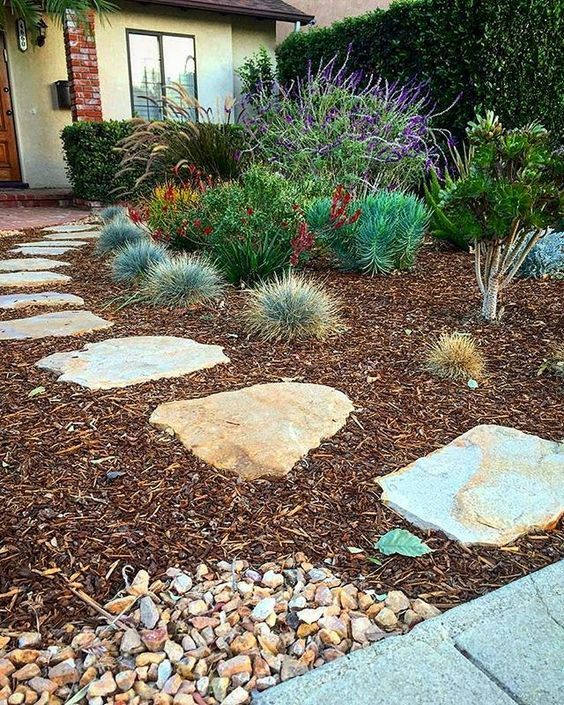 There’s no need to sacrifice curb appeal to save water. 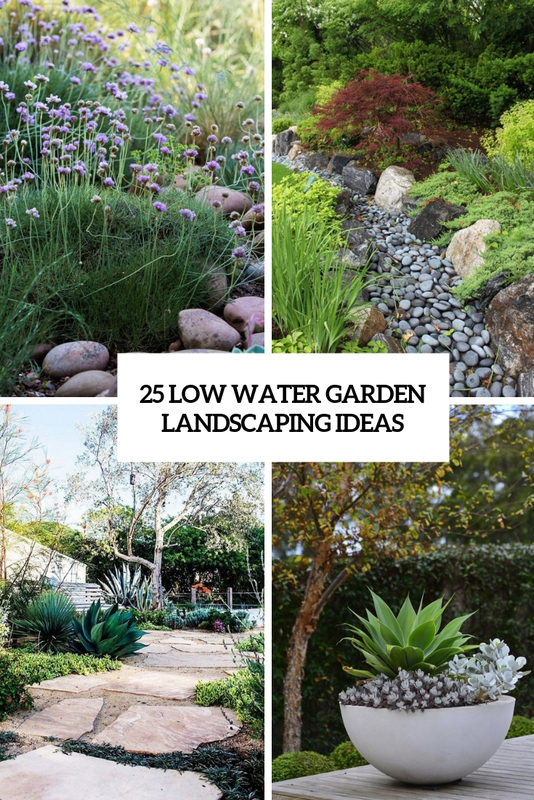 Here are some smart low water landscaping ideas that will make your garden and other outdoor spaces appealing without much water. 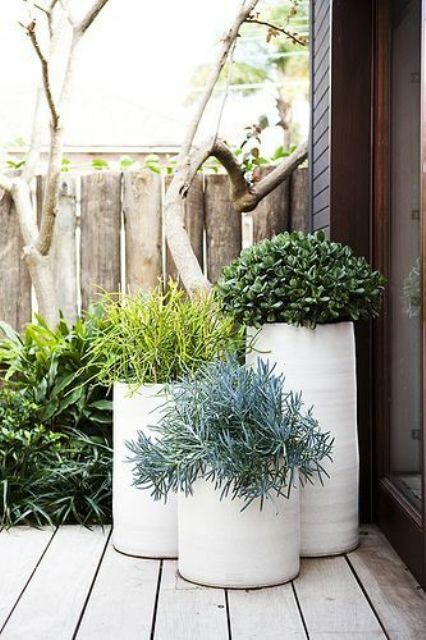 Let’s take a look at these options. 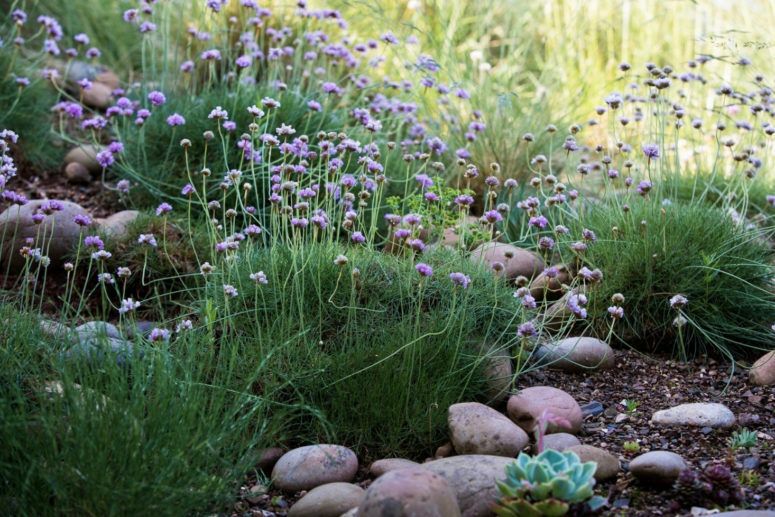 Ground cover is essential in exposed areas for retaining moisture and preventing soil erosion. 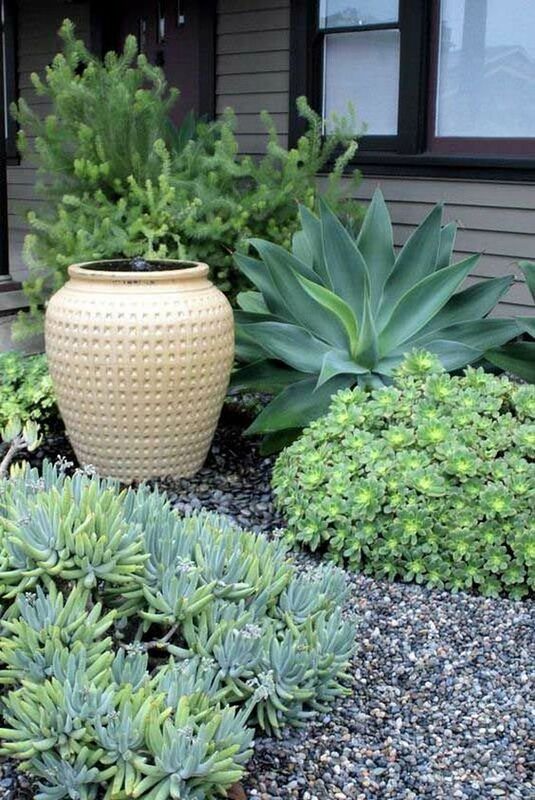 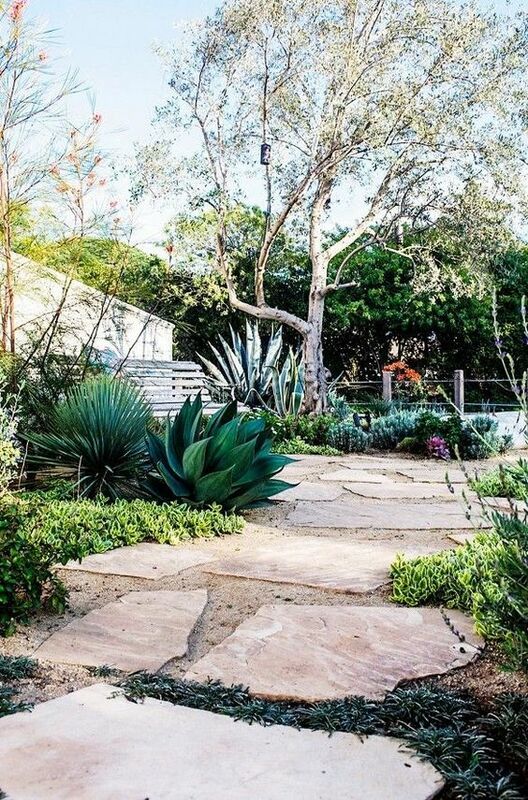 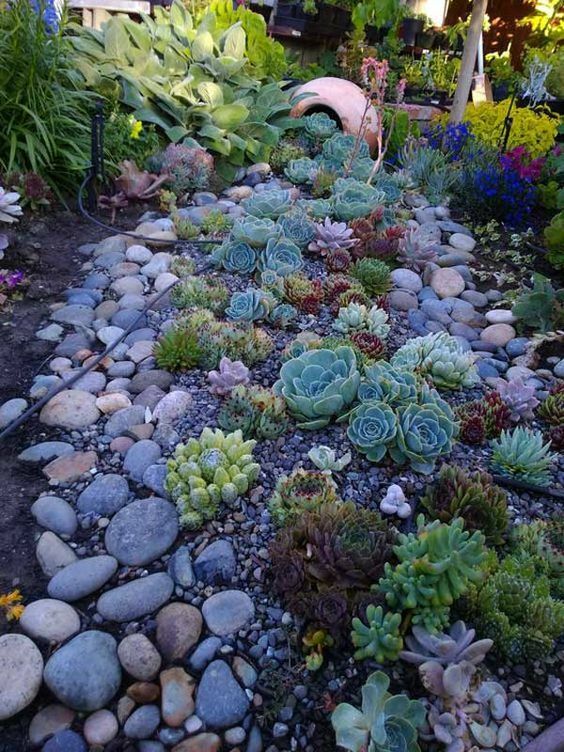 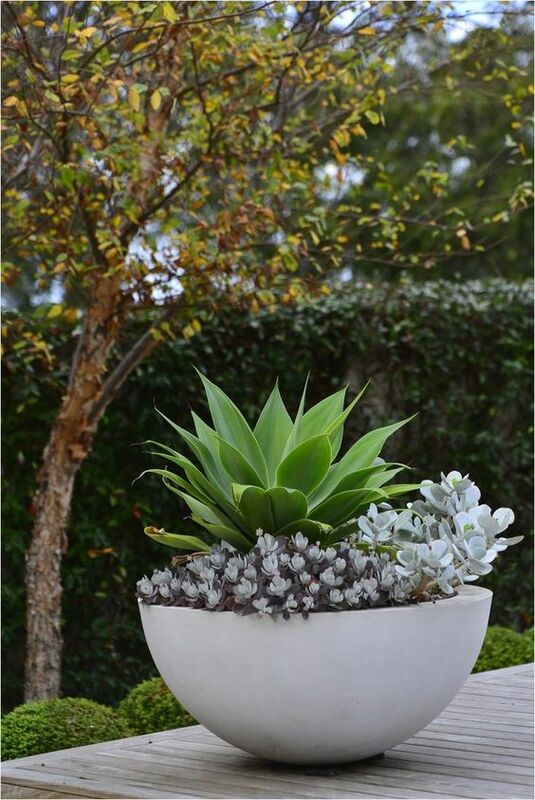 Drought tolerant succulents and some kinds of drought-tolerant herbs and blooms are perfect to cover the ground. 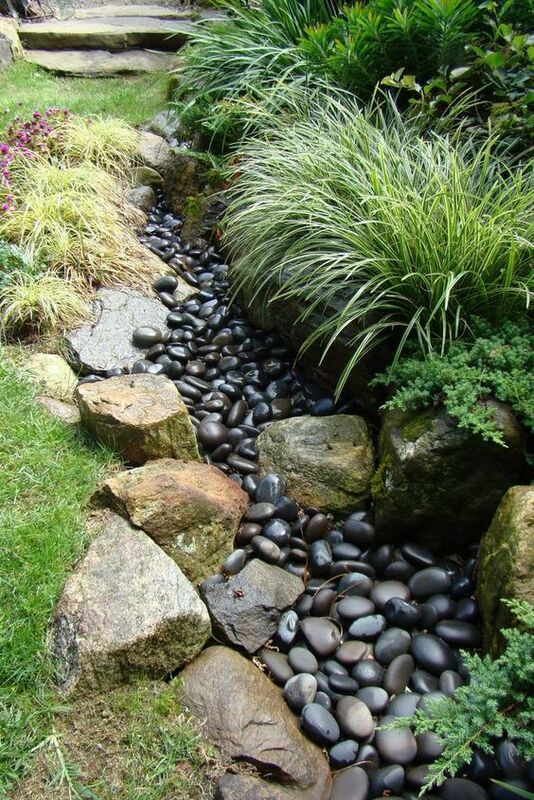 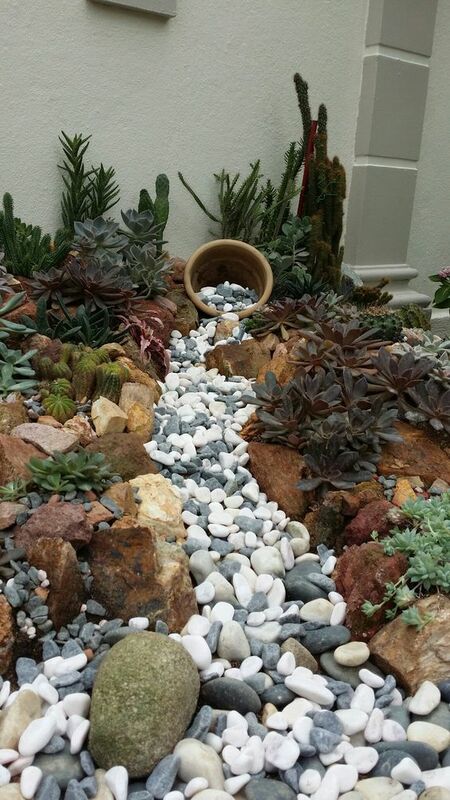 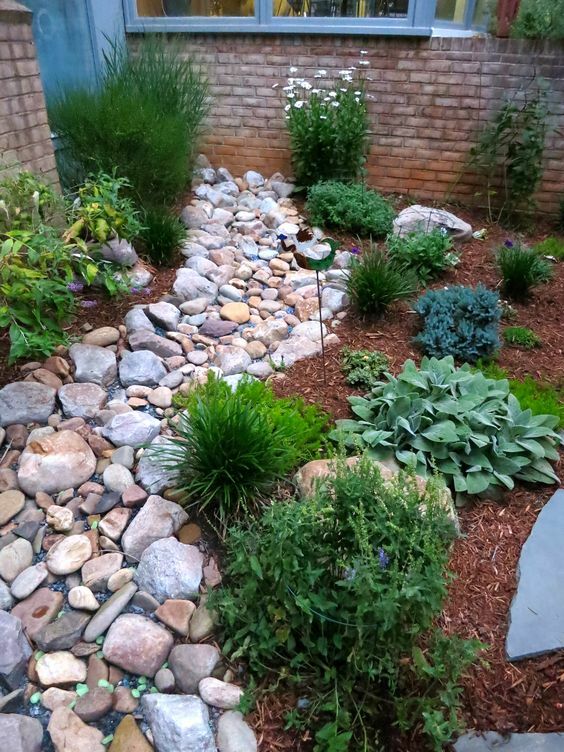 A dry creek bed, also known as a dry stream bed, is a gully or trench, usually lined with stones and edged with plants to mimic a natural riparian area. 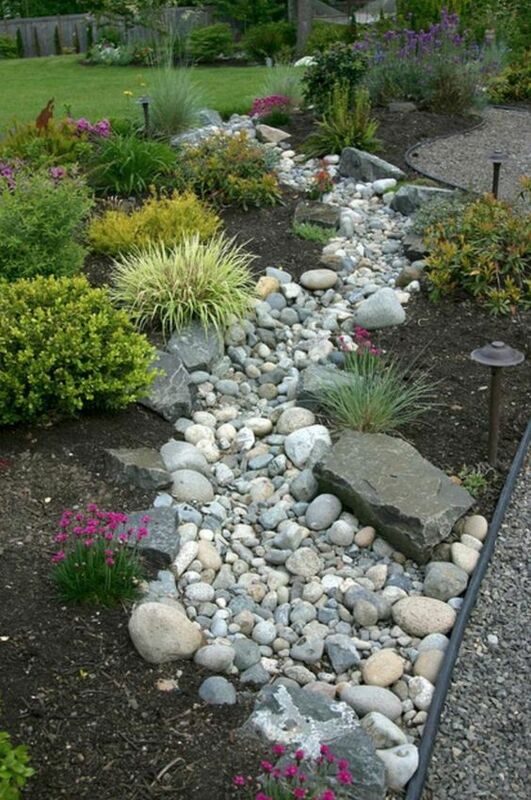 You may decide to implement dry stream beds for drainage, thus preventing erosion by reducing runoff. 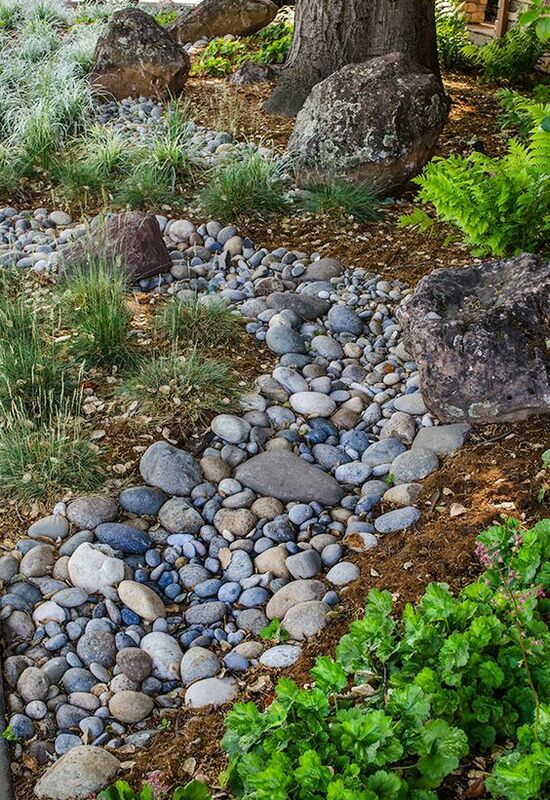 Once you’ve finished creating a dry creek bed, plant native shrubs, ornamental grass or flowers along the banks and disguise the “headwaters” with large boulders or plants. 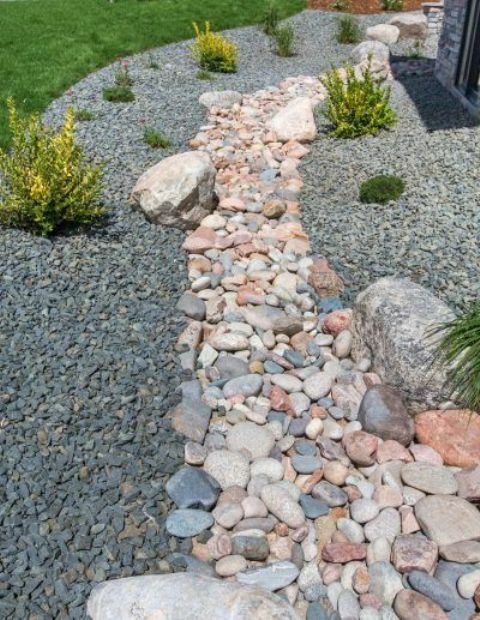 Interesting dry creek bed ideas also include logs, stepping stones or wooden bridges. 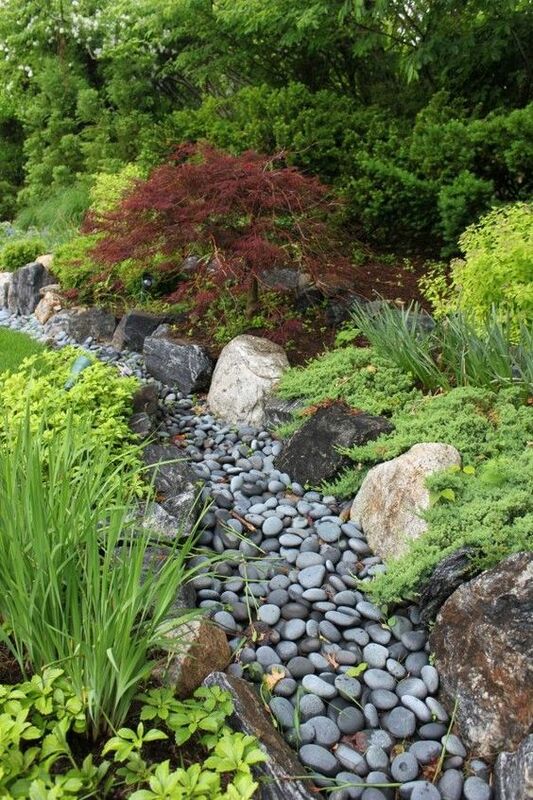 Moss adds a natural element if your dry creek bed is in the shade. 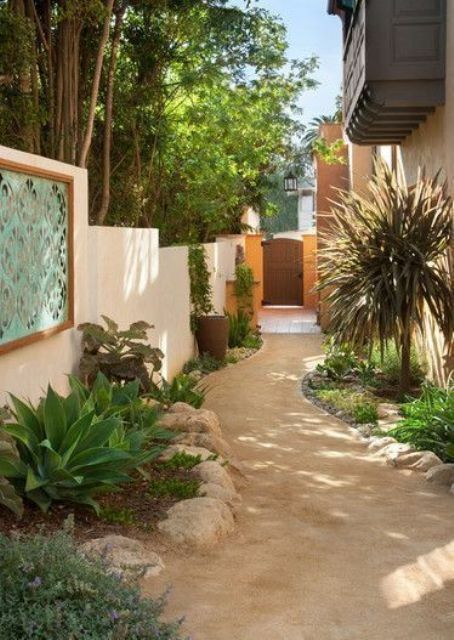 When choosing what to cover your pathways with, think decomposed granite. 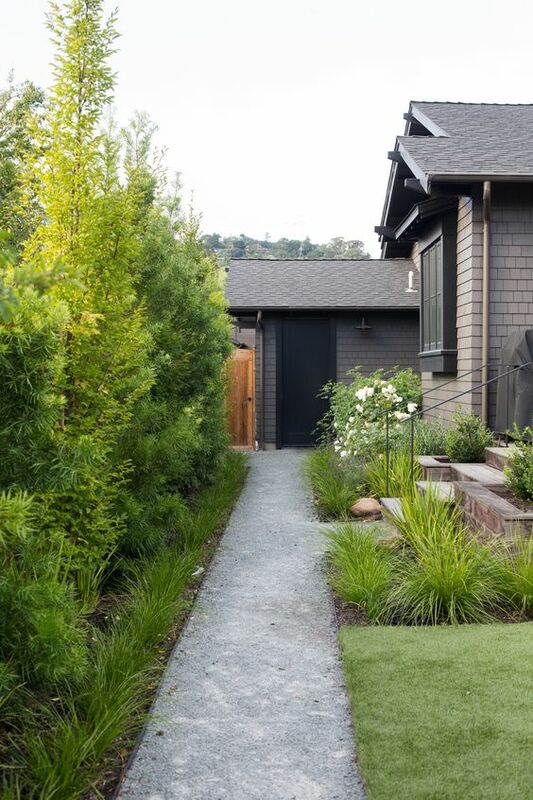 Soft underfoot, decomposed granite comes in soft, natural colors—shades of gray and tan, mostly—and allows rainwater to percolate. 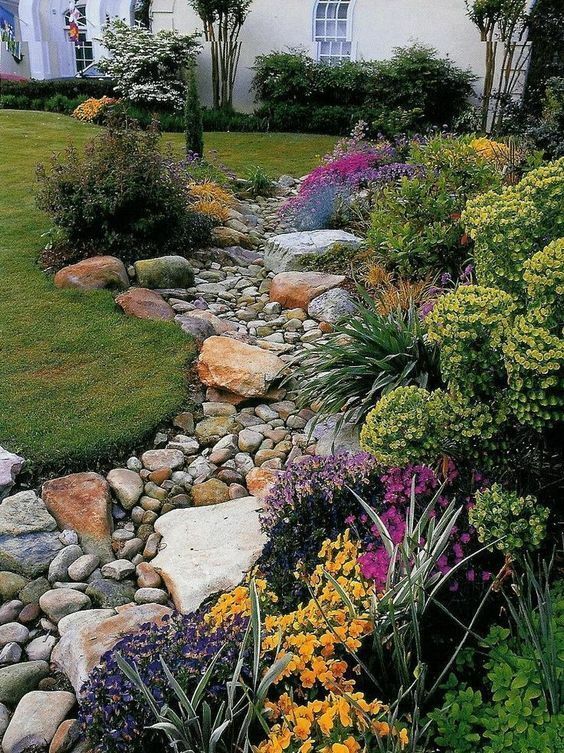 You may also substitute traditional lawns with granite. 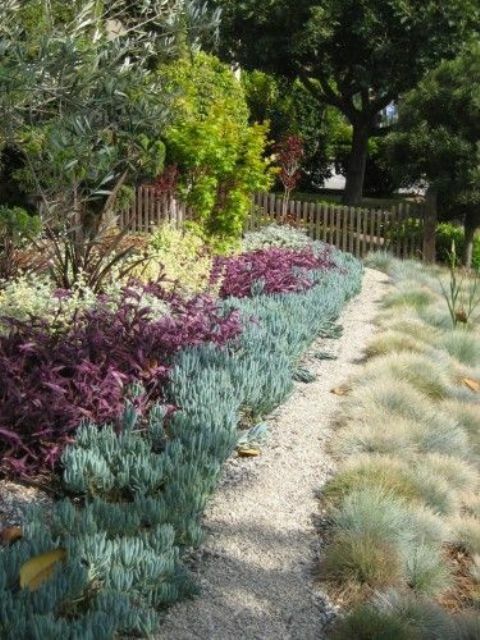 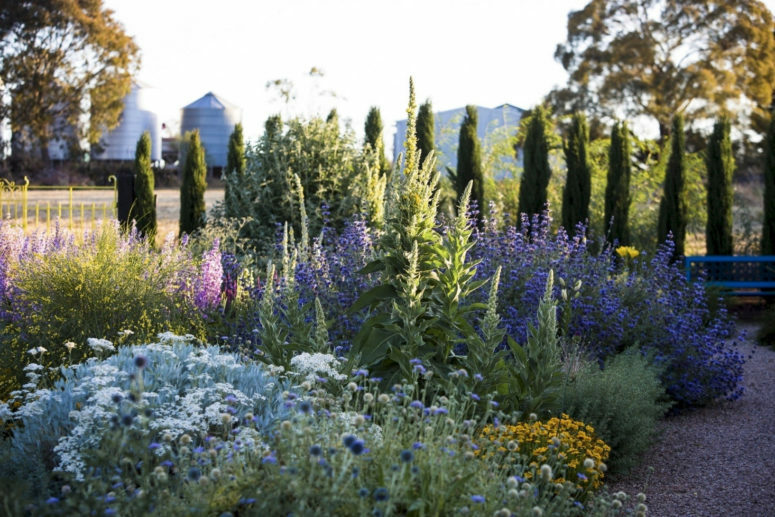 Silver- and felty-leafed plants do well in drought. 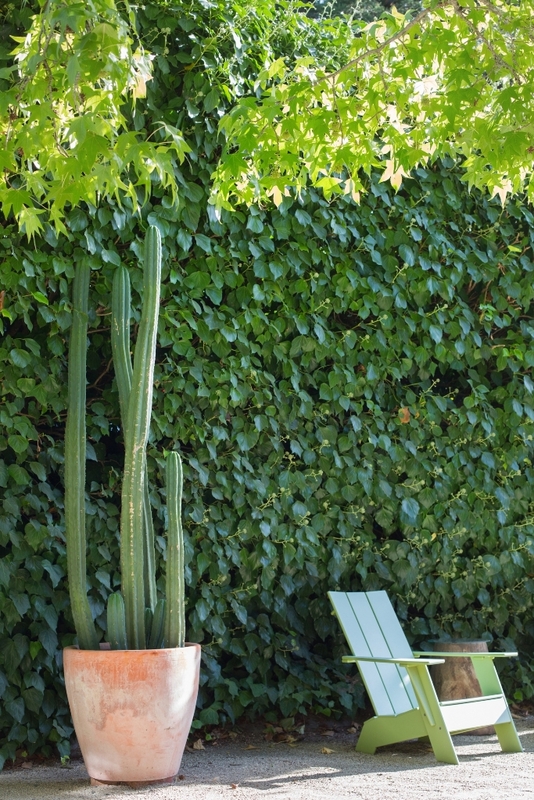 A focal plant—such as a potted succulent, like euphorbia, in front of a high hedge of mature ivy—adds a layer of texture and warmth to a gravel courtyard. 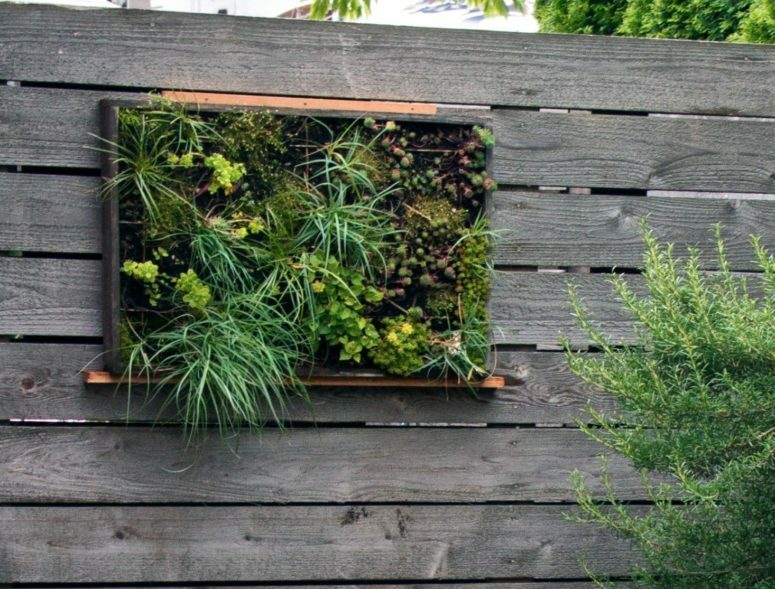 A vertical garden of succulents creates a focal point on a fence or facade without requiring more than a few inches of depth. 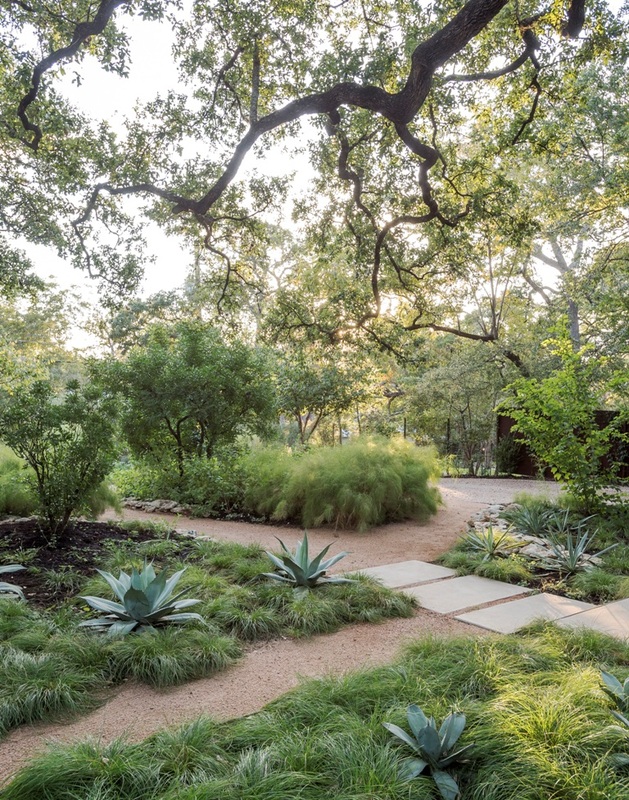 Many types of grasses that aren’t your average green blanket lawn grasses are drought-tolerant and perfect for a low-water garden. 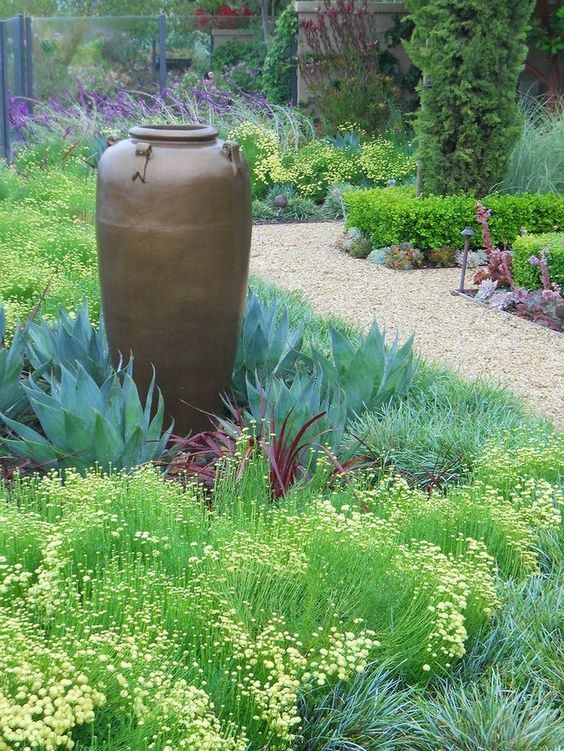 Some of the most beautiful and low water ornamental grasses worth adding are: Little Bluestem, fountain grass, Blue Oatgrass, Purple Fountaingrass, Blue Fescue, Pampas Grass. 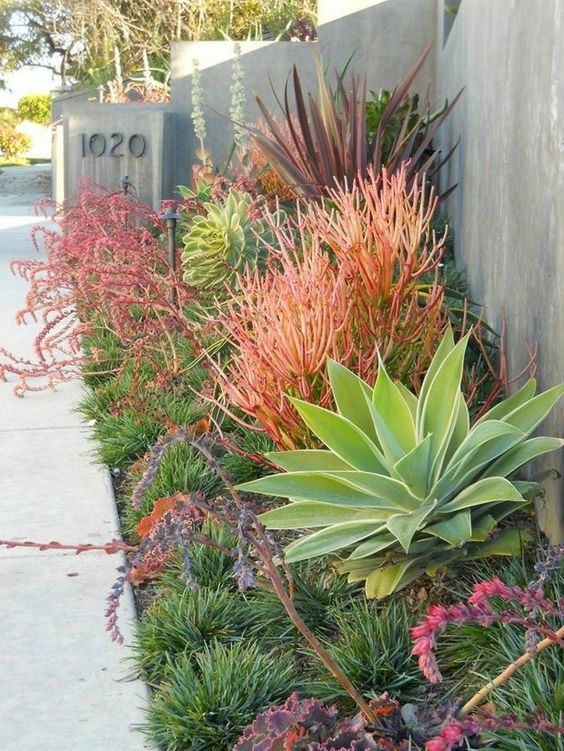 When planting grasses, mix it up: Use both tall and short grasses along with a few of the more colorful grasses thrown in for pop.